Fly Fishing with Doug Stewart: The Perfect Fly? Some anglers say that in order to catch fish you have to tie a fly that has to be an exact replica and size of the natural. This may be true in certain conditions, such as gin clear water, quiet pools or heavily fished streams, but in many cases larger, unkempt patterns are more effective. I found this out many years ago during a trip on the Deschutes River. When he showed it to me I couldn’t believe my eyes. It had a large front grizzly and brown hackle, a thick body of rusty, orange carpet fibers and a thick elk hair wing that was almost four inches long. I politely thanked him and went down to another hole where I instantly started to catch one fish after another. This reminded me of some famous comments about tying flies that are less than perfect. 1. Tie the body 2/3 up the hook shank and secure it. 2. Tie in a large clump of elk hair so that it extends about 2 inches behind the hook shank. 3. 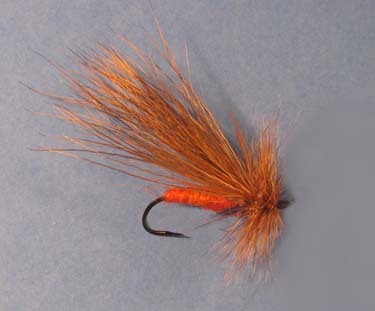 Select a large brown and grizzly hackle and one at a time spin them forward toward the hook eye. Tie them off and cement the head.